One of the best ways to prevent your luggage from being lost or stolen is to make sure it stands out. LOQI luggage covers bring flair to your bag in a variety of designs to suit your travel style. Easy on and easy to spot on the baggage carousel, each LOQI cover also comes in a matching tote perfect for souvenirs and other items purchased in the airport or while traveling. 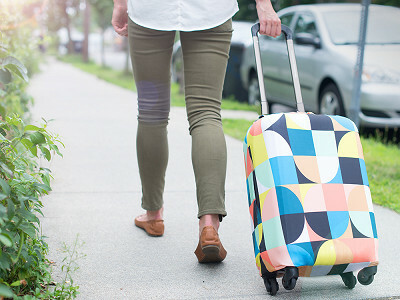 In addition to helping you distinguish your bag from other standard colored suitcases such as blue and black, a LOQI cover can also add a bit of protection against scratches, scuffs, and rainy weather. With LOQI’s eye-catching luggage covers and totes, your belongings are a lot less likely to get lost in the crowd. Drop us a line from the USA, we are eager to add our pennies worth from Berlin and spread our enthusiasm for the great illustrators working for LOQI! Was excited when I saw this - Looking for covers for ALL our luggage.....seems like a great idea. But only that one size? How come? Need it for the LARGE size luggage also. @Kathy Hi Kathy, Thanks for your question. The luggage covers stretch to fit luggage with these dimensions. Are you covers ONLY for hard sided luggage? You mention they are good for checked luggage so is there different sizes? Are these TSA approved for checked luggage which often gets inspected ? 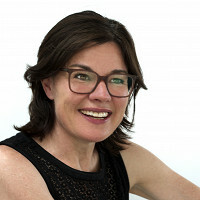 Amy from The Grommet team here. These covers will work on both hard and soft sided luggage. Our research is showing they are not specifically TSA approved but aren't restricted for flights. I will confirm this shortly. @Amy Yes, sure. TSA approved. Love love these! I just bought a red suitcase but because it was made with softer plastic/fiberglass material, it came with a cover - which was black. So it defeated the purpose of buying a suitcase that would stand out. I'm probably going to buy one but do you have one for Los Angeles (my adopted, much loved/hated home)? I am VERY enthusiastic! So glad that you like these. Right now LA isn't available but I'm sure that Belinda would love this type of feedback. If it does become available in the future, we will let our community know. Can you show installing the cover on the luggage in the video? that would be very helpful. Would love to see a video on the cover goes on the luggage. We have filmed a short clip of this process here. The suitcase we have on hand isn't quite large enough so there was some extra material but the piece essentially looks like a onsie that has an opening for the head and then snaps at the bottom. What a great idea. Would love to see Boston included in a new design is the team is working on one! And definitely you need to add sizes for larger luggage (checked luggage). I like the idea, but have doubts TSA will put back my luggage "sweater" after they're done ransacking my checked luggage. If I have a lock on my luggage it's a 50-50 shot that they put it back when they're done. @Deborah In the past we haven't had any feedback that the luggage gets "undressed". Rather miles and miles of smiles in the luggage catacombs. I think a "beach" style and a snowy "winter wonderland" design would sell very well. I would buy them :) Also for the nature lover maybe a forest of trees? We have Samsonite soft sided luggage, does it work with that? Loqi works with both soft and hard sided luggage. It fits most medium sized luggage and can stretch to fit if it's larger. One of the best ways to prevent your luggage from being lost or stolen is to make sure it stands out. LOQI luggage covers bring flair to your bag in a variety of designs to suit your travel style. Easy on and easy to spot on the baggage carousel, each LOQI cover also comes in a matching tote perfect for souvenirs and other items purchased in the airport or while traveling. 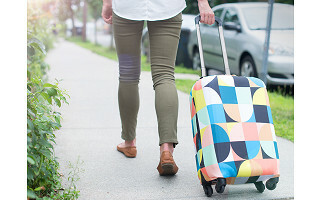 In addition to helping you distinguish your bag from other standard colored suitcases such as blue and black, a LOQI cover can also add a bit of protection against scratches, scuffs, and rainy weather.